Who wants to follow the crowded paths everyone takes, right? You need to get away from these tourists trying not to step on each other’s feet. So many advantages and finally, not having to hurry anymore trying to take that funny picture. 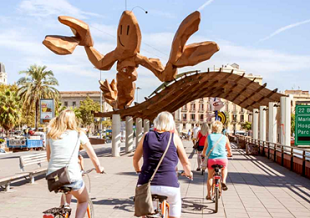 Moreover, you will meet interesting people on your way, such as local people and like-minded cyclists. These encounters won’t take place being in your car. As mentioned before, you will feel more free than ever and be able to do whatever you want. And being free means less stress. You will not have to worry about trying to find a parking spot anymore or run out of fuel in the middle of nowhere. Being free also means: taking time for you and your family. Time to think and realise how lucky you are being able to seize this opportunity all together. After all, traveling by car or metro can be up to 6 times more expensive than by bike. Think of every penny you will save and spend on more interesting things, such as an excellent local dinner. Also, everyone has at least felt bad once in their life for not being environment friendly. If you are, great. If you aren’t, this is a perfect way to contribute to the global warming. While peddling your bike, and notice the healthy trees around you, you will eventually realise the impact of it. You will learn a lot and have a great feeling of accomplishment. If you’re looking for a predetermined tour on the web, you will get suggested a thousand. All you need to do is select one that fits your expectations. 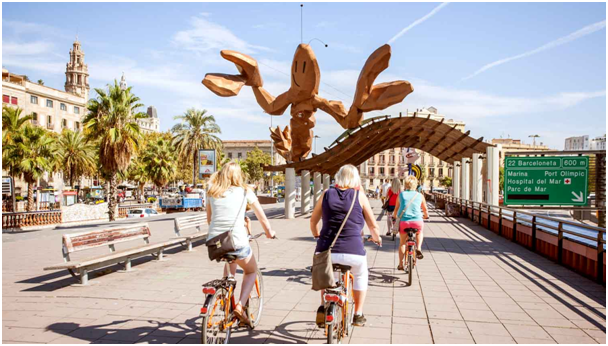 The place where you will hire your bikes, will give you interesting suggestions as well. Keep in mind the difficulty and the attractions you wish to visit. 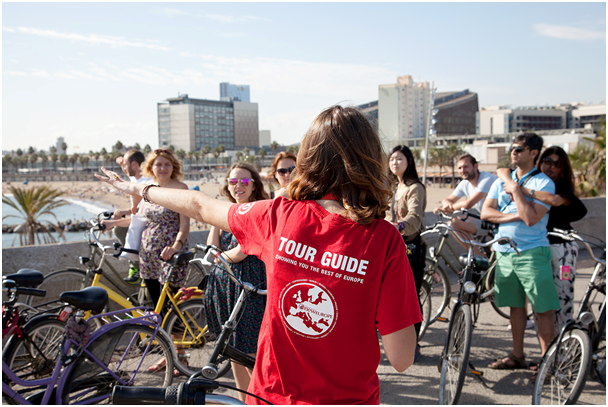 Although peddling through the nature is amazing, you also want to enrich your cultural knowledge. 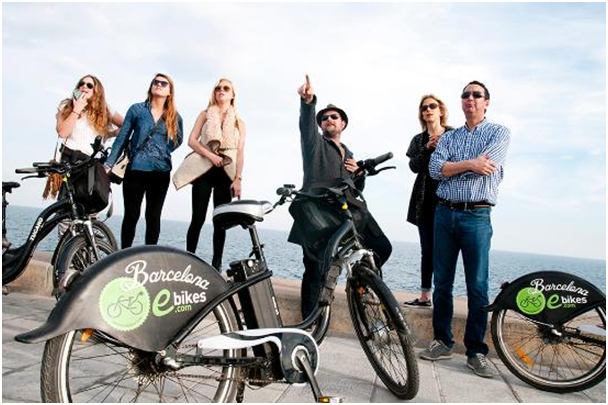 Some places even offer a ‘tapas tour’, ‘surprise tour’ or a ‘night tour’. 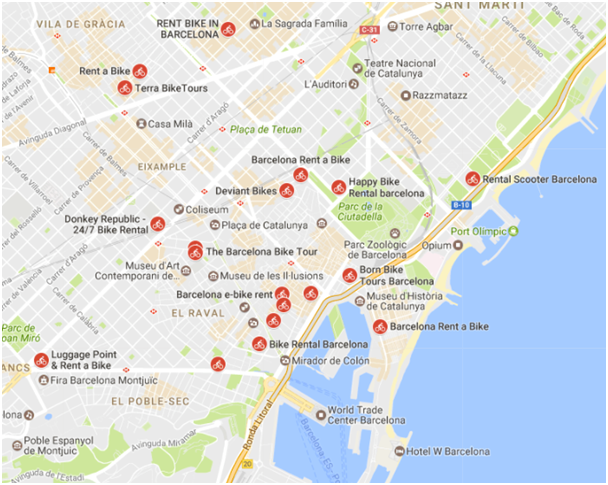 Finding a rental shop in Barcelona won’t be a problem as you can see in the overview here below. Don’t wait and book a room for your family in Sarrià now!